All home medical supply companies are NOT the same.The quality of home care can differ significantly from one organization to another. The Centers for Medicare and Medicaid Services (CMS) and many other licensing agencies have established stringent provider requirements for Home Health agencies, Hospices, and Durable Medical Equipment Suppliers (DMEPOS) to participate in the program. Not all DME companies choose to be accredited. T&C Flynn’s Pharmacy & Home Medical voluntarily chooses to be accredited in order to provide the absolute highest standard of services and products. Accreditation is a formal means of measuring our organizational management, internal processes, patient safety practices and service outcomes. This professional peer review is administered by ACHC (Accreditation Commission for Health Care). ACHC is a private, nonprofit organization that is structured to establish higher standards than the state or federal requirements. Flynn’s feels that our accreditation with ACHC is one of the key benchmarks for measuring the overall quality of our organization. Rest assured that we will continue to voluntarily pursue professional accreditation in order to improve the quality of our patient care. We understand that you have a choice in home medical suppliers. 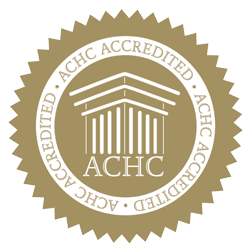 Hopefully our continued pursuit of excellence through our accreditation with ACHC will earn your trust and make us your #1 choice. We work directly with physicians, hospitals, medical facilities and agencies throughout the Berkshire County area to coordinate a patient’s discharge process and help develop a home care plan specific to each patient. Our billing teams are experienced in Medicare, Medicaid and third-party billing for patients with a variety of different insurance plans. At Flynns, we also maintain accreditation with several professional agencies where standards of care and services are of the highest rating in our industry. We do this to continually provide quality assurance and principals of professionalism that “go the extra mile”, just for you. T&C Flynns is PROUD to be reaccredited, March 2015, with the Accreditation Commission for Health Care.